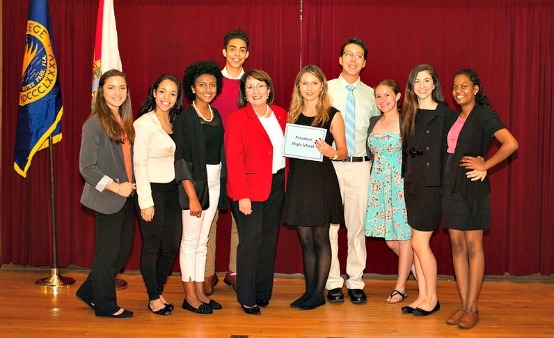 Orange County Mayor Teresa Jacobs hosted her Fourth Annual Youth Leadership Conference at Rollins College in March as part of her ongoing commitment to engage students in their local government. More than 200 high school student leaders from 22 Orange County Public Schools attended the half-day event which teaches students about their local government, how to participate in community initiatives and how to strengthen their leadership skills. The purpose of the Conference is to expose young citizens to the many opportunities available to get involved in Orange County Government. The event is ideal for young leaders who participate in student government, community service clubs, debate teams, honor societies, and drama clubs. This year, students were once again given the challenge to post videos on Facebook, recapping what they learned at the conference, and a chance to “job shadow” Mayor Jacobs for a day. Each high school will collaborate on their video and one school will be selected as the winner of the Mayor for a Day Challenge in late April. A collection of photos from Mayor Jacobs’ Fourth Annual Youth Leadership Conference are available for use by the media and are located on Flickr.